Fifty miles due East from New York City, in a lovely hamlet on the North Shore of Long Island, is the Centerport Yacht Club which overlooks the scenic waters of the Long Island Sound. Its members are boating enthusiasts first, but they also enjoy many social events offered by the club year round. Tommy Vine, a long-time member with a keen interest in all things wine-related, takes the lead in organizing an annual gourmet food and fine wine event. In a relaxed setting, CYC members are treated to a fun learning experience, each year bringing in a guest wine professional to select and present the wines. On November 2nd, I was honored to be invited as this year's guest wine presenter, giving a brief presentation with each course as to why the wines paired so well with the food. Chef Joseph Comunale, the Club's Executive Chef, collaborated with me to create an 'over-the-top' food and wine experience. He made my job an easy one with his outstanding menu of creative and flavorful dishes. Chatting with the guests after dinner, I discovered that everyone had a great time and had enjoyed all of the food and the wine, with each person having their own personal favorites. As intended, the event was a successful learning environment for those interested in understanding the nuances of how great food is enhanced with the proper wine pairing. Do you need a guest wine speaker at your next event? Contact me, Lisa Denning, at lisa@thewinechef.com, for more information. The Centerport Yacht Club's restaurant has Mionetto Prosecco on hand at all times for its guests. It was the perfect way to greet everyone and start the evening off with its fresh and fruity aromas, low alcohol (11% ABV) and bright and lively acidity. 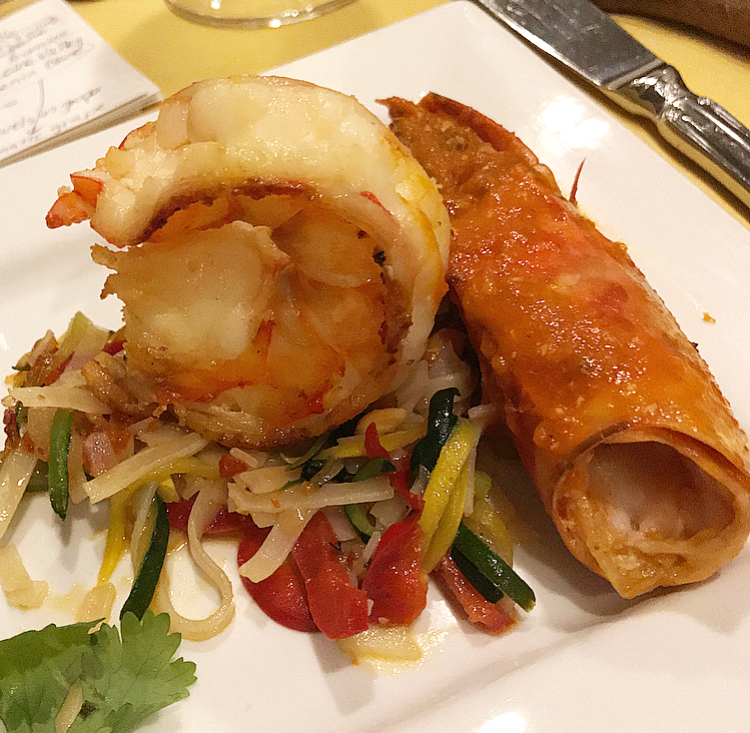 The Ravines Dry Riesling 2015 from the Finger Lakes was a perfect match to the slightly spicy Thai flavors in the Shrimp Pad Thai dish (see recipe below). With its bouquet of white flowers and distinct minerality, this white wine was one of the stars of the evening! I have to say, this bacon chop was my favorite dish of the night. It was such a playful rendition of savory meat with sweet elements. 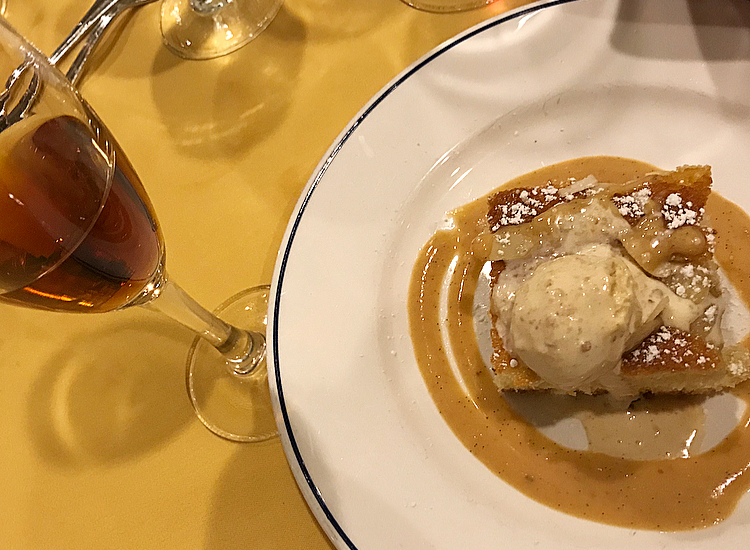 The 2016 Champalou Vouvray, 100% Chenin Blanc, with its bright acidity and honeyed finish complemented the salty and sweet flavors of the dish (see recipe below). Read more about Champalou wines here. Some people were surprised I had picked out a red wine to go with fish. But a rich fish like salmon always pairs well with Pinot Noir, especially one from this fantastic Sonoma Coast producer, Failla Winery. After the dinner, many people told me how they unexpectedly LOVED the wine with the fish! This big, yet elegant, single vineyard Malbec from Argentina is made from grapes grown at high altitude, giving it a lovely freshness. It was the perfect accompaniment to the hearty lamb dish. Neither the food nor the wine overpowered the other — they were in perfect harmony! I'm including two photos of the dessert (and the recipe below) because it was that good! The Morenita Cream Sherry from the highly regarded Bodegas Emilio Hidalgo was a bit hit. With it's slightly sweet and nutty flavor, it was perfect with the sweet, creamy and almond flavors in the dish. During the evening, Chef Joe came out from the kitchen to share with the guests details about each special dish. He also sent me the following recipes to share with you. I hope you try them and enjoy!! Season the prawns with the garlic, 1 tbsp oil, salt and pepper. Heat up a medium sauté pan with 2 tbsp oil on medium-high heat. Gently place the prawns into the sauté pan and sear on both sides until golden-brown and cooked through. Place uncooked noodles in a bowl of cold water to soak. Spiralize or julienne the zucchini, red pepper, onion and carrots into noodle like shapes. Heat a tbsp of oil over medium-high heat. Add the veggies- stir fry for 2-3 minutes. Be careful not to overcook the veggies. Transfer to a dish and set aside. Drain the noodles, add a tbsp of oil to the hot pan. Add the sauce and veggies to the pan along with the peanuts and chopped herbs. Place the prawns on top of the noodles and serve immediately. Peel apples, and discard the seeds and skin. Medium Dice the apples into a bowl with ½ teaspoon of the ground cinnamon and 1 tablespoon brown sugar. Remember to reserve the other ½ teaspoon ground cinnamon for later. Heat a lightly buttered skillet over medium heat, add apples and cook until soft and reserve for later. Beat together egg, heavy cream, salt, nutmeg and vanilla extract. Dunk each slice of bread in egg mixture, soaking both sides. Place in pan and cook on both sides until golden in color. Drizzle with maple syrup and serve hot. Slice the bacon chop ½ inch thick. You will get 6 pieces weighing 8 ounces each. Grill the bacon chop on each side with grill marks. You’re bacon chop is ready to be served. TIP: You may use any apple you want or non-organic syrup. I like Granny Smiths because they are sweet. When everything is done, just plate it up and eat it all together. I like to do my French toast on the bottom then the bacon chop on top (see photo) and use the apples for the garnish. Grease an 8-inch spring form pan with 1 tbsp. butter and line the bottom with round parchment paper. Set aside for later. Prepare pears by peeling, coring and cutting in half. Set Aside. In a large bowl or electric mixer, beat the butter, almond paste and white sugar together until fluffy — this step is very important. Add the eggs, one at a time and beat well. Using a spatula, fold in the flour, ground almonds and baking powder. Transfer batter into the spring form pan and evenly distribute with a spatula. Only fill about an inch thick-it will grow in the oven. Leave the cake to cool in the tin, then run a knife around the outside and carefully remove the base and cake. Sprinkle with confectioners sugar. Cake is ready to be served with the creme anglaise (below). Bring brown sugar, butter, and milk to a gentle boil and cook until thickened, 1 to 2 minutes. Remove from heat, and let it air cool. Whisk egg yolks and sugar in medium bowl to blend. Gradually whisk hot milk mixture into yolk mixture. Return custard to saucepan. Stir over low heat until custard thickens and leaves a path on back of spoon when finger is drawn across, about 5 minutes (do not boil). Strain sauce into bowl. Cover and chill. At the end of making both sauces, add the caramel to the crème Anglaise and the sauce is done.